The Oitavos is situated a mere 30-minutes from Lisbon International Airport. Why does an incredible view become even more beautiful when gazed upon from an impressive perch? Sitting next to the infinity pool at The Oitavos, or languidly floating within its depths, one becomes convinced that there is no sight as beautiful as the Atlantic coast. The creators of The Oitavos, of course, would agree with that statement, as it was inspired by the Atlantic coast’s beauty. The dramatic, romantic appeal of the ocean is reflected in the design of The Oitavos, where sleek lines and effortless grace serve as the perfect backdrop for abundant natural beauty. Sculptures and paintings by Portuguese artists provide a little something extra for the hotel's lovely interiors. 142 guest rooms come complete with private balconies that offer views of the ocean or golf course, while 16 suites provide guests with extra space. Drink and dine in a unique Portuguese restaurant or bar, visit the adults only Spa and Fitness Center, or simply sit back, relax, and enjoy the view. Send an availability request with your requested dates to the The Oitavos. Open plan suite with integrated bathroom, generous sitting and TV area, private balcony. Please note, max occupancy for each room is two adults and two children, only one child between the ages of 3-16 can be included in each booking, incurring a 60 Euro per night supplement. Please note, max occupancy for each room is two adults and two children, only one child between the ages of 3-16 can be included in each booking, incurring a 60 Euro per night supplement. Open plan loft with generous sitting and TV area, private balcony, view of the Atlantic Ocean. Please note, max occupancy for each room is two adults and two children, only one child between the ages of 3-16 can be included in each booking, incurring a 60 Euro per night supplement. Open plan suite with generous sitting area, private balcony and Atlantic Ocean views. Please note, max occupancy for each room is two adults and two children, only one child between the ages of 3-16 can be included in each booking, incurring a 60 Euro per night supplement. Premium Corner Rooms are located on the South end tip of the hotel building. All the rooms have an area of 64m2 and feature large wrap around balconies of 34 to 44m2. The 5 Premium Corner Rooms face South and West or South and East and offer golf and dramatic Atlantic Ocean views. Please note, max occupancy for each room is two adults and two children, only one child between the ages of 3-16 can be included in each booking, incurring a 60 Euro per night supplement. This fantastic extra spacious suite is located in the Northwest corner of the top floor offering dramatic views of the Atlantic Ocean, golf and mountains from its balcony with 33m2. This one-bedroom suite features a separate living and dining area as well as an independent washroom and can connect to a second bedroom through the living room. Please note, max occupancy for each room is two adults and two children, only one child between the ages of 3-16 can be included in each booking, incurring a 60 Euro per night supplement. 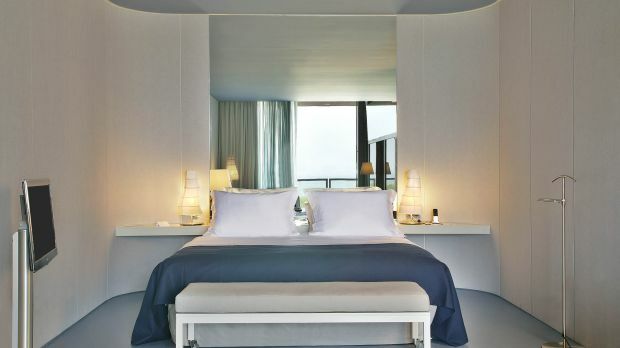 The Oitavos Suite has an area of 120m2 and is located at the Southwest end on the top floor of the hotel. This one-bedroom spacious suite features a separate living and dining area as well as an independent washroom. Having the biggest balcony of all suites with 60m2, it offers sweeping and dramatic views of the Atlantic Ocean and the golf. Please note, max occupancy for each room is two adults and two children, only one child between the ages of 3-16 can be included in each booking, incurring a 60 Euro per night supplement.